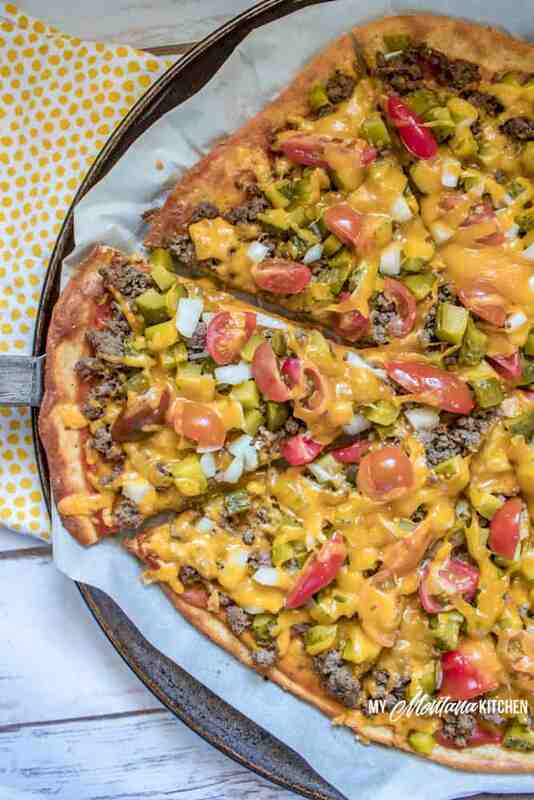 Cheeseburger Pizza combines the best of two family favorites – pizza and cheeseburgers! A sturdy low carb crust is topped with a savory sauce, crumbled ground beef, onions, tomatoes, dill pickles, and lots of cheddar cheese! Sometimes it can be difficult to find healthy recipes that your family will enjoy, but they are sure to run to the table you serve this family friendly pizza! This keto friendly pizza recipe is also gluten free, and a Trim Healthy Mama S Recipe. When I first began my Trim Healthy Mama journey, I was constantly amazed at all the delicious food we can eat. Two of the things I loved most were Pizza and Stromboli. So decadent, with all the old familiar flavors that I loved, but made smarter and with healthy ingredients. In fact, I will be sharing some of my favorite pizza recipes below! 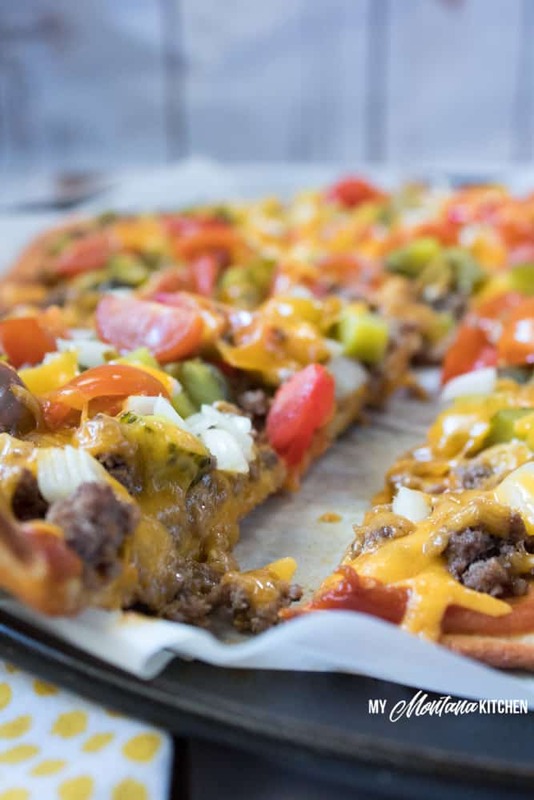 If you have never heard of Cheeseburger Pizza, you are not alone. I had never heard of them until last month when my sister-in-law sent me a text message with a picture of her dinner. (Which just happened to be a Low Carb Bacon Cheeseburger Pizza.) Thank you, Joanna! It looked delicious – luscious ground beef, melty cheese, crisp pickles and onions . . . REALLY good! Think about it. If you love cheeseburgers, why wouldn’t you like a hamburger pizza? With all the toppings it makes a hearty and filling meal that even your husband and teenagers will love! I have tried a variety of methods for making low carb pizza crusts. Cauliflower, yes. Ground chicken, yes. Almond flour, yes. The list could go on and on. But my favorite healthy pizza crust recipe is the dough used in my Low Carb Stromboli. When using it as a crust, I typically omit the Italian seasonings. One of the reasons I love this particular dough is because it uses the Trim Healthy Mama Baking Blend in place of most of the almond flour. This lightens up the dough, while still giving it a great texture. In fact, this is the most sturdy keto pizza crust I have ever used. You can easily pick it up and eat it with your hands! 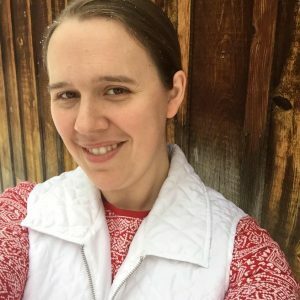 Now let’s get on to those tips for making the perfect low carb pizza dough! When microwaving the cream cheese and cheese, I usually microwave for thirty second intervals, then stir well. This ensures that I have an even melt and that I do not scorch the ingredients. This dough also works best when you use an egg that is room temperature, not cold from the refrigerator. When mixing, it is sometimes hard to get all the ingredients to incorporate evenly. I like to mix for a bit in my bowl with a wooden spoon, then I turn it out onto parchment paper and knead it a bit with my hands. This ensures that I have a homogenous dough. Rolling out the dough between two sheets of parchment paper makes forming the crust so easy! When the dough is rolled out to the right size, I just remove the top layer of parchment paper and slide the other piece of paper (with the dough) onto my pizza pan. I have an old, beat up round pizza pan that I absolutely love, but you could shape this dough into a rectangle and bake on a baking sheet as well. This pizza pan is similar to the one I use. You don’t even need pizza sauce for this recipe! Using the condiments normally found on a cheeseburger gives you all of that luscious cheeseburger flavor! The topping are completely customizable to the preferences of your family. If you don’t like onions or tomatoes, you can omit them. If you prefer mozzarella cheese over cheddar, go for it! Customize it for your family and own it! Because of the burger and all the extra toppings, I find that this cheeseburger pizza is very filling. I like to serve it with a large side salad, and I find I am usually full after only one slice of pizza. I actually used venison in place of hamburger, because that is what we have on hand. I never even purchase burger! I rolled my dough quite large – at least a 12 inch circle. When I cut the pizza into slices, I only cut it into 8 pieces, so the slices were quite large. Feel free to cut it into smaller portions if that works better for your family! 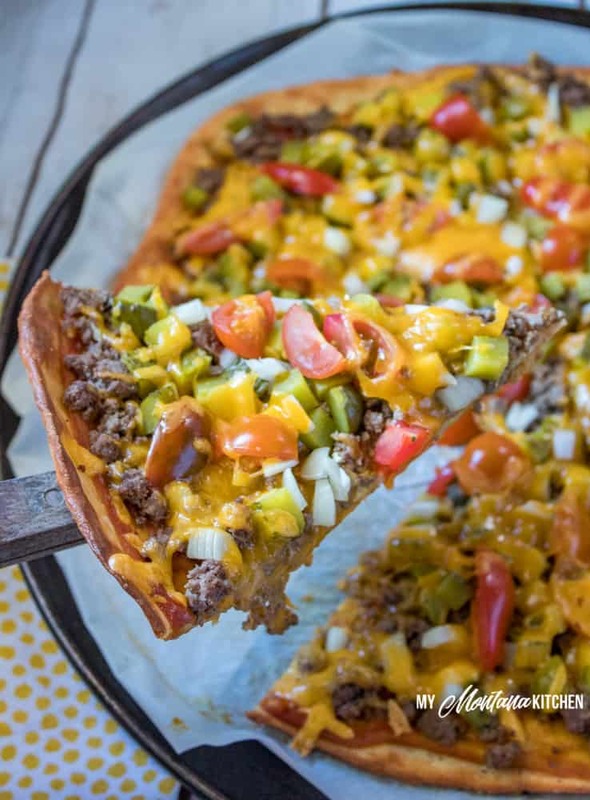 Cheeseburger Pizza combines the best of two family favorites - pizza and cheeseburgers! A sturdy low carb crust is topped with a special sauce, crumbled ground beef, onions, tomatoes, dill pickles, and lots of cheddar cheese! Make the Low Carb Stromboli Dough. Roll dough out between two sheets of parchment paper until you have a large 12-14 inch circle. Place the dough on a pizza pan lined with parchment paper. Prick all over with a fork (this will reduce bubbling). Bake for 10-11 minutes, or until crust begins to turn golden brown. Mix the ketchup and mustard together and spread over baked crust. Sprinkle ¾ cup shredded cheese over sauce. Add hamburger, pickles, onions, and tomatoes. Bake for approximately 10 minutes, or until the cheese is melted and bubbly. You can use all Baking Blend in the Stromboli, or you can also just use all almond flour. Either way works well. I can not wait to try this. I love cheeseburger pizza but have been trying to eat low carb. I’ve been able to stay away from pizza but I would LOVE to be able to have some!! Thanks for sharing! I hope you enjoy, Stephanie!